Start-Up India: Enough fuel to go the distance? On the evening of Saturday, 16 January, in New Delhi, when Prime Minister Narendra Modi unveiled measures to boost the growth of Indian start-ups, investors and entrepreneurs in attendance cheered him on like rock music fans listening to their favourite band. The measures included a Rs.10,000-crore fund to be deployed over the next four years, exemptions from capital gains tax on investments, favourable labour policies, faster and cheaper patent applications and easy registration for new firms. The measures were announced by Modi at an event called Start-up India, a government initiative that brought young entrepreneurs, venture capitalists and policymakers under one roof. In August, while delivering his Independence Day address from the ramparts of the Red Fort, Modi coined the slogan “Start-up India, Stand up India” to encourage innovation and entrepreneurship among the young. Modi’s aim is to make India a top destination for all kinds of start-up businesses. The government invited some of the world’s biggest start-up names to the event on Saturday, including SoftBank Corp.’s founder Masayoshi Son, taxi-hailing service Uber Technologies Inc.’s founder Travis Kalanick and collaborative workspace provider WeWork founder Adam Neumann. Apart from them, all the top Indian entrepreneurs were present. In India, start-ups such as online marketplaces Flipkart and Snapdeal have almost overnight become among the most valuable and successful private companies. In all, new-age start-ups attracted more than $9 billion in capital over the past two years. India ranks third among global start-up ecosystems with more than 4,200 new-age companies, behind only the US and the UK, information technology lobby group National Association of Software and Services Companies (Nasscom) said in a report in October 2015. The number of active investors grew from 220 in 2014 to 490 in 2015, while the number of incubators or accelerators grew to 110, a 40% increase. “With 100% growth in the number of private equity, venture capitalists, angel investors, along with a 125% growth in funding over last year, the Indian start-up ecosystem has risen to the next level,” said the report, titled Start-up India-Momentous Rise of the Indian Start-up Ecosystem. India is also the youngest start-up nation with 72% of the founders being less than 35 years of age, the report said. Start-ups present a rare bright spot in an economy that has expanded at a disappointing pace over the past three years and one in which private investment still hasn’t picked up. No wonder then that the government is keen to promote the growth of start-ups or be associated with them to boost its own image. After the hype of Start-up India, however, the jury is still out on whether the measures announced by the government amount to much. 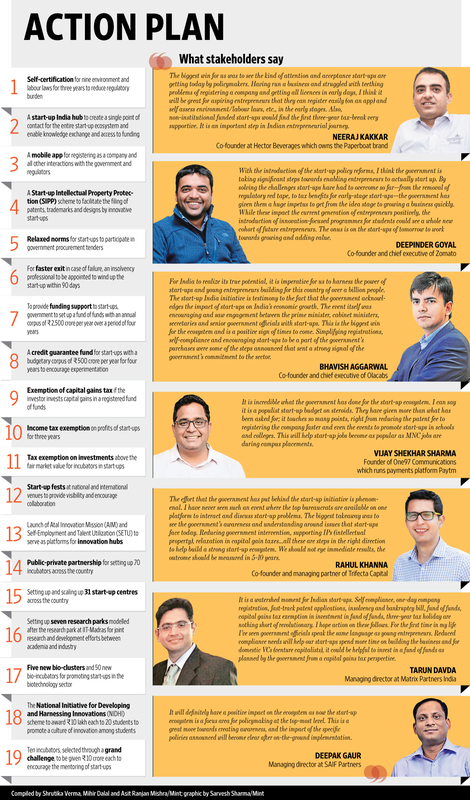 While some of these measures enthused existing and aspiring entrepreneurs, it remains to be seen how these policies take shape. On behalf of tech start-ups, iSPIRT, a software products think tank, had intensely lobbied with the government and regulators to obtain favourable policies. iSPIRT had submitted to the government a list of 34 issues that it said were driving Indian start-ups away from the country. Of the 34 problems, only eight have been resolved so far by the Start-up India measures and other announcements, iSPIRT said. “No doubt the Start-up India action plan has provided various important exemptions and incentives to start-ups. However, the key question is this—whether the action plan adequately addresses the irritants that make the Indian start-up ecosystem unattractive? In our view, the answer is no,” iSPIRT said. Tax holidays, ease of closing companies and investment fund are measures that will make it easier for companies to do business, said Sudhir Singh, partner at consultancy PricewaterhouseCoopers India. “However, these measures alone will not help spurt the government’s ambition of having 300,000 start-ups. Today, entrepreneurs require world-class infrastructure to build world-class companies. Basics such as electricity, Internet connectivity, roads, clean environment and curbing corruption require immediate attention for building a strong foundation to achieve our ambition,” Singh said. To be sure, some measures announced by Modi have the potential to effect significant change. The exemption of the 20% capital gains tax has been a long-pending demand of overseas venture capital investors who route their investments through Mauritius to avoid paying taxes. While investors are exempted from paying tax on long-term capital gains in the case of listed companies in India, they have to pay 20% on such gains from investments in privately-held firms. So, most investments in Indian start-ups are routed through Mauritius as capital gains tax on investments from that country is waived due to a provision in a double taxation avoidance treaty. However, the proposed waiver of capital gains tax will only come into effect after a formal proposal in the budget next month is approved by Parliament. Several venture capital firms are also waiting for the fine print before they assess its impact. “From what it looks like, the capital gains tax kicks in only when you invest in the MSMEs (micro, small and medium enterprises). I can only wish that the universe of these investments is expanded,” said a top executive at a venture capital firm on condition of anonymity. Reducing red tape and making patent filing simpler are other positive measures. Start-ups, which the government has defined as companies registered in India in the past five years and with an annual turnover not exceeding Rs.25 crore, will now be allowed to self-assess businesses for the first three years of operations. Modi, in his speech on Saturday, said start-ups will not have any inspection visits by government officials for the first three years, in a measure aimed at helping young companies save time and money. “Having run a business and struggled with teething problems of registering a company and getting all licences in the early days, I think it will be great for aspiring entrepreneurs that they can register easily (on an app) and self-assess environment/labour laws, etc., in the early stages,” said Neeraj Kakkar, co-founder of Hector Beverages Pvt. Ltd that owns the Paperboat brand. The intent to clear roadblocks for younger companies is clearly there and should be helpful in attracting investment in early-stage companies and encouraging young people to start their own ventures, said Albinder Dhindsa, co-founder of grocery delivery app Grofers. Protection of intellectual property in India has been challenging, and the new policy on patents can help protect innovations in the country, said Anurag Jain, co-founder and chief operating officer at Girnar Software Pvt. Ltd, which owns automotive marketplace Cardekho. Some other measures as well as the government’s definition of a start-up itself are questionable, experts said. “The government seems to have given only one, narrow definition for start-ups. This needs to be changed because it excludes many innovative businesses,” said Harish H.V., partner at Grant Thornton India. Start-ups have been exempt from paying taxes for the first three years. But considering most start-ups don’t make money so early, such an exemption would have little impact. The government will set up a fund with an initial corpus of Rs.2,500 crore and a total corpus of Rs.10,000 crore over a period of four years. The creation of state-sponsored funds for start-ups is fraught with danger. Most start-ups fail. Should the government put taxpayer money into funding new ventures, a task that is tough even for experienced investment professionals? Additionally, the government made no reference to two of the most important issues for start-ups—rules on foreign direct investment (FDI) and Net neutrality. Many of India’s top e-commerce firms, including Flipkart and Snapdeal, are being investigated for possible violation of FDI rules. The status of these investigations is not clear. There is the perceived threat to start-ups from initiatives such as Facebook Inc.’s Free Basics, which violates the principle of Net neutrality, according to Net neutrality activists. Free Basics is an initiative under which users get free access to Facebook and some other sites and apps on their smartphones. By giving free access to some sites at the expense of others, telecom networks and Facebook will make it tough for new Internet ventures to come up, Net neutrality activists say. The government will give its ruling on Net neutrality after the Telecom Regulatory Authority of India, or Trai, submits its final recommendations on the issue early this year. While hyperbole marked the Start-up India event on Saturday, regulatory clarity and favourable policies still remain elusive for start-ups. “It is undeniable that India’s start-ups need to be saluted, encouraged and fostered. The Modi government deserves to be lauded for recognizing this and accomplishing it in its characteristic pomp and splendour. However, the temptation to translate that into policy actions by splurging taxpayer funds in venture capital is illogical and a travesty of the ‘minimum government’ promise,” Praveen Chakravarty, co-founder of angel investor network Mumbai Angels, wrote in an article in Mint this week.